Accounting, billing and many other financial management features in the same service. Automatically, digitally, easily and cheaply. Spend less time on bookkeeping and more time doing the work you love. Automated software will help you forming monthly bookkeeping. 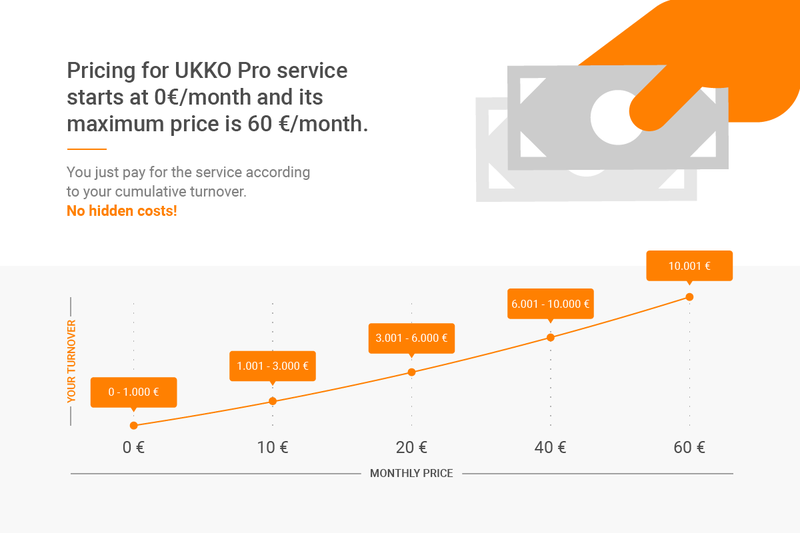 Send invoices to customers and receive invoices straight to UKKO Pro. Save your time and money! 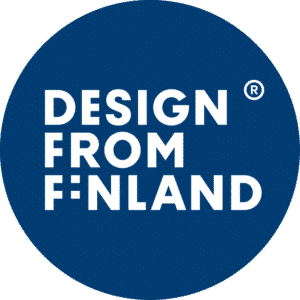 UKKO Pro will help to calculate VAT for you and to inform VAT to Finnish tax authority. Move your financial worries to us! Do you want to be an independent entrepreneur, but you are worried about how to deal with all the boring tasks alone? 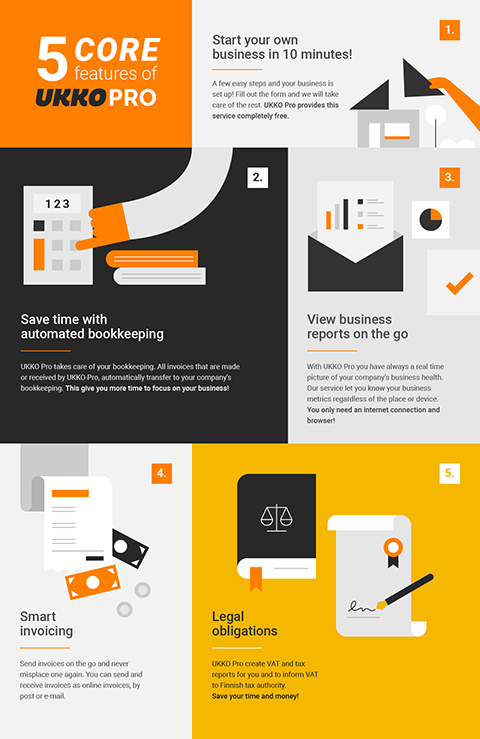 UKKO Pro is the solution for small business owners, who want to make entrepreneurship as easy and simple as possible! UKKO Pro offers solutions for digital financial management with modern tools like invoicing, automated bookkeeping and real-time financial management. With our service, you know exactly what you pay for, even before you are invoiced. We have a clear pricing model with no hidden costs. And you get always free support. UKKO Pro makes bookkeeping and billing super easy, saving your time and money. You can send invoices, add receipts and take care of your bookkeeping with any device you want. No more lost receipts, take picture straight after purchase and add receipt to UKKO Pro. Any invoices made and received by UKKO Pro are automatically transferred to your company’s bookkeeping. You just have to add other receipts. This is also easy when you take a photo of the receipt straight after the purchase and add to our service. Digital financial management has never been so easy! We use modern technology such as AI, machine learning and automation to make your accounting faster and safer than with a traditional accounting firm. Customer support is also available whenever you need it! With UKKO Pro, you have a real-time picture of your company's finances. Every day. Year around. There will be no surprise cash flow problems that prevent you from starting that next project. You will receive an income statement, VAT- and Tax calculations from us. 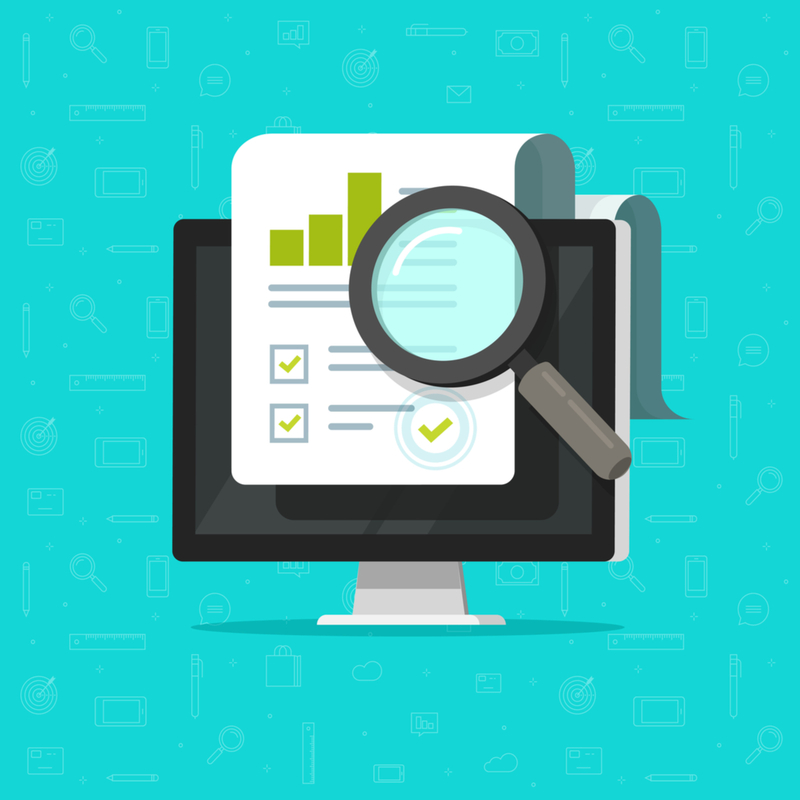 Our reports are simple enough for you and help you confidently make decisions to keep your business on the right track. UKKO Pro is 100% web-based, so you just need an internet connection and browser. Easy right? We will not leave you alone under any circumstances. You will always receive personalized service for free. Get all the tools for financial management in one place. You have access to all your financial data, from any device anywhere. 24/7 Online bookkeeping and highly skilled accountants ensure your books are always handled and always accurate. Send invoices on the go and never misplace one again. You can send invoices as online invoices, by post or e-mail. It's time to go digital. Forget paperwork and filing. Take a picture with your phone and add to UKKO Pro. Receive invoices directly from online service. Save your customers and products in an easy-to-use register.